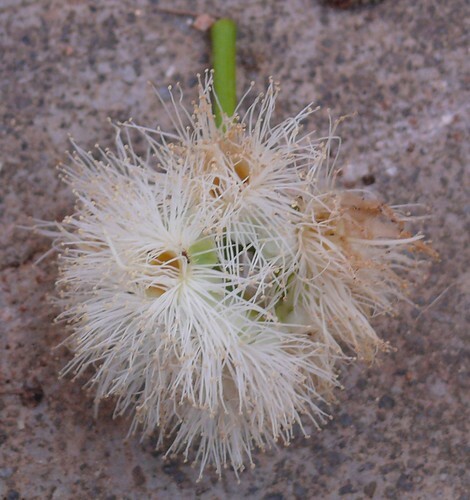 In the past two weeks, Sea Apple trees have been flowering around Singapore. 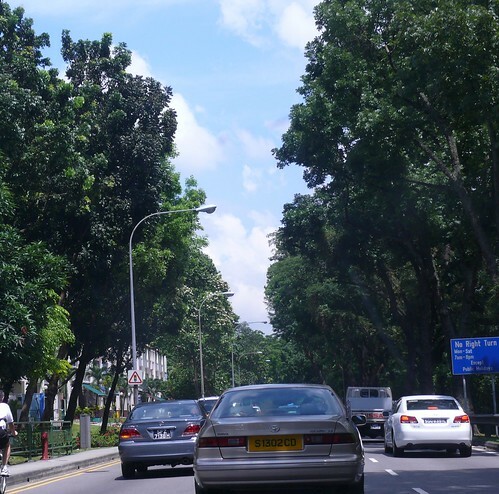 I have seen trees in East Coast, Bedok, the city near Little India and Beach Road, Bukit Timah, Pasir Panjang and Holland Village flowering and wonder if they have been doing so elsewhere. The white flowers are in compact clusters so are quite prominent once you look out for them, especially against overcast skies which we have experienced so often recently and most of this year. Since I am reporting this rather late, the older flowers are browning already so you will be seeing whites and browns against the dark green of the Sea Apple canopy now. The flowering must have started at least a fortnight ago, and I couldn't ignore it any longer. 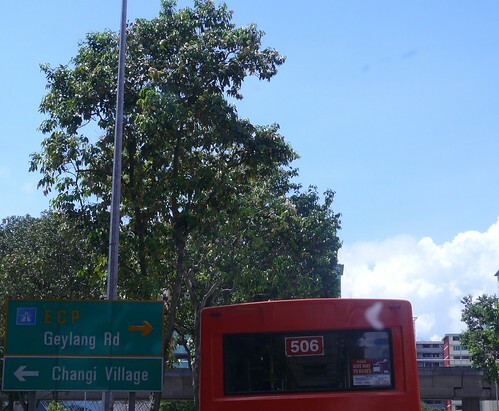 So while traveling to a Hari Raya lunch last Saturday, I took some photos, unfortunately all taken against a very strong midday sun and mainly behind the glass of the car's windscreen! Its enough to tell a story, though, and freely available, like all Habitatnews photos, for download and non-commercial use. This is great for people prepraing presentations in a hurry - you don't even have to ask for permission, just cite the source (I usually provide the URL or site name below photos I use) which is good practise anyway. You will have to adjust the contast and brightness as the photos are quite raw. To view the album, click any of the photos below. 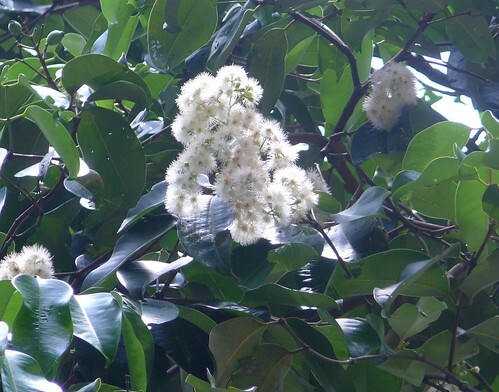 This native, coastal tree species, Syzygium grande (Family Myrtaceae), was formerly Eugenia grandis and the local name of Jambu Air Laut is often abbreviated in conversation to Jambu Laut. 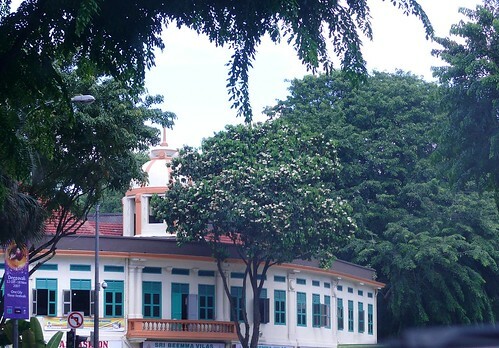 According to NParks' Singapore's Heritage Tree Register [pdf], heritage tree no 153 is a Sea Apple tree of 5.6 metre girth at Fort Siloso, Sentosa Island. Wonder if its flowering too. Flowering means nectar drinking animals like butterflies and birds, perhaps even bats will arrive to drink their fill of this energy-rich offering. In the process they help pollinate the flowers. And after flowering comes fruiting, so there can be a lot to see and naturalists knwo this well! 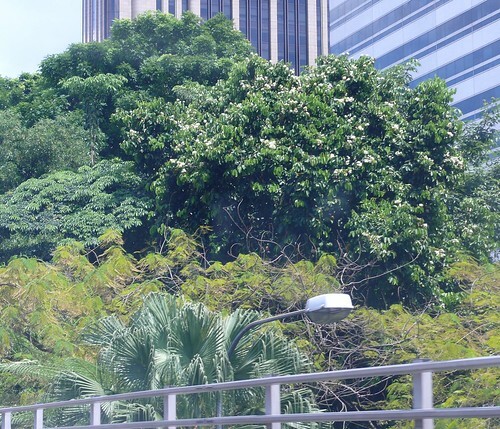 Probably worth a visit would be the Jelutong Tower at MacRitchie; see this entry from two years ago - "Flowering Sea Apple Trees at Sime Forest," by Subaraj Rajathurai. Bird Ecology Study Group, Nature Society (Singapore), 31 Oct 2005. 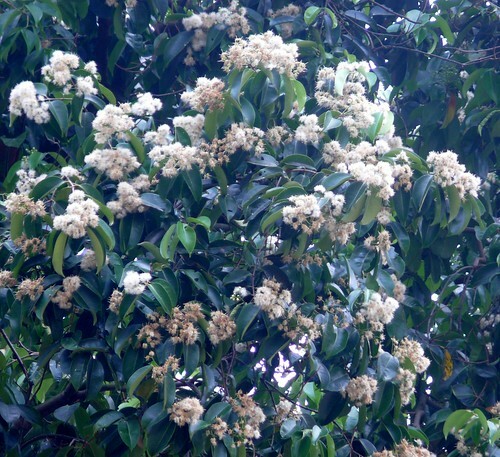 Many tropical trees synchronize their annual cycles of flowering (e.g. Tembusu in June 2007 Rubber trees), and less commonly, perhaps every 2-10 years, there is a mass flowering event in topical rainforests that involves many species. In June 2005, Adrian Loo took a few walks after the flowering to enjoy the fruits of their labour (sorry, could not help it). That's really for another blog post another day. Back to our Sea Apples, do drop me a note if you have seen these trees flowering elsewhere (even in the region) and also if you have nice photos. Better still, post pictures on your flickr account and tag them with "syzygiumgrande", the scientific name. Do also add other tags like - singapore, seaapple, the specific location etc. The more you tag the easier it is for people to find your material.